Happy Kitchen Sink Stamps Monday! I hope you had a great weekend! I've been a bit under the weather lately, and am thankful I'm finally starting to feel better! I'm headed to Anaheim later this week for the Craft and Hobby Show, and can't wait to see what's new on the crafting scene. If you're going to CHA, or happen to live close to Anaheim CA, Kitchen Sink Stamps will be hosting a Meet & Greet at the Peacock Inn Suites on Monday, January 25th, from 7-9PM. If you've ever wanted to experience Kitchen Sink Stamps Multi Step Stamping, you'll want to stop by! You can email me for more details. I'm must lovin' the Cup of Warm Comfort set from Kitchen Sink Stamps! 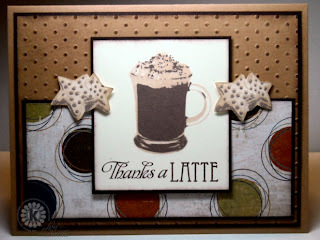 I used CPS150 as the inspiration for my layout, stamping the cup of cocoa as my focal image and adding the sentiment Thanks a Latte in Memento Rich Cocoa. Following the sketch, I stamped the cookies as my embellishments. Click here to save 10% on your Kitchen Sink Stamps purchases, then enter code LISA10KSS at checkout. Beautiful work with this fabulous mug image, Lisa!! Love the layout!! Hope you are feeling better and better and that your trip is a huge success! Give all the KSS girls a hug for me!!! I'll be thinking of you all and wishing I was there!! mmm mmm good your card that is!!! Terrific as usual!!! This is just such a yummy card, Lisa!! Love how you have the coocies on either side, and such fun DP too!! Mmmmmm your chocolate looks delish, Lisa! Love the fun dp, too! That has to be the perfect DP! You always have such wonderful projects to share with us Lisa, and this week is no exception. Hope you have fun at CHA! Sorry you've been ill....hope you are rarin' to go to CHA! This is a wonderful card, as usual! Great card, love the paper you paired with the image & the cuttlebug background as well! Definitely let me know the deets on the meet 'n' greet! Lovely card! That stamp is really neat! Thanks for joining us at CPS this week! THat is one yummy looking card! So cute! I love that stamp- I love your card! I hope you feel better and enjoy the California sunshine while you are at CHA. Will you be posting what's new and teasing us from CHA? LOL....I had to make myself a coffee and some cookies after seeing your card. Mouthwateringly delicious.!! This is awesome - love your coloring and choice of papers! Great card! Glad to hear you're feeling better (& glad I wasn't the only one sick!). I'm super jealous you're heading to CHA; have fun!